Is your small business website design aligned to your marketing strategy? A small business website design must be aligned to your marketing design. The success of your small business website depends very much on your internet channels and your traditional channels. A successful internet marketing strategy depends strictly on how they interact and integrate together. 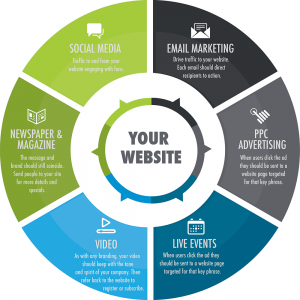 As a result, it is important that your company website is integrated with all your channels. Therefore, as part of an effective multi-channel strategy it is especially important that you build a successful internet marketing strategy. Direct your message to a consistent target market. If you try to reach customers with different and varied needs your business website will not work. Make it especially relevant to your primary target market. Develop a compelling online value proposition. What benefits do you offer to your visitors? Customers want benefits not features. Ensure that your online strategy is aligned with your traditional channels. Use long and short term plans. Prioritise and be specific about your goals and aims. Have clear objectives for your business website. Your strategy should outline brand development and your leads and sales goals. Integrate online and offline communication tools. First of all, you need to attract visitors to your business website. Manage your customer lifecycle. You should support visitors in their buying process. Help them select and select your products or services combining other channels.